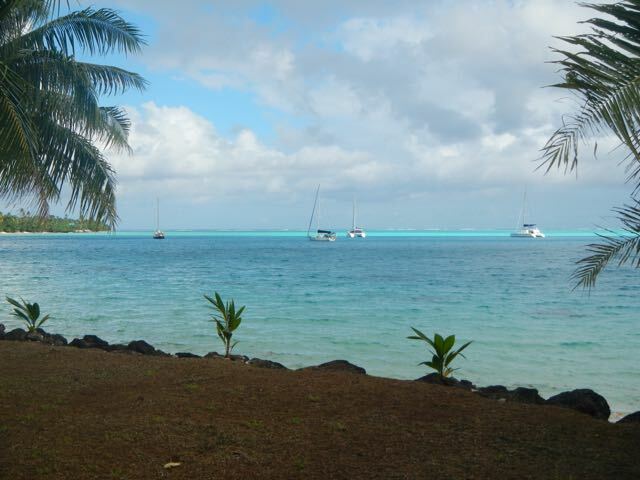 We're just about as far south as we can go on the Western side of Huahine Iti, and although there isn't a lot of wind shelter there is some. Regardless, the place is beautiful. There's a stunning coral garden awaiting below the surface. The dinghy dock has fresh water for the asking, and there's Wifi. We've had several good meals here, already. 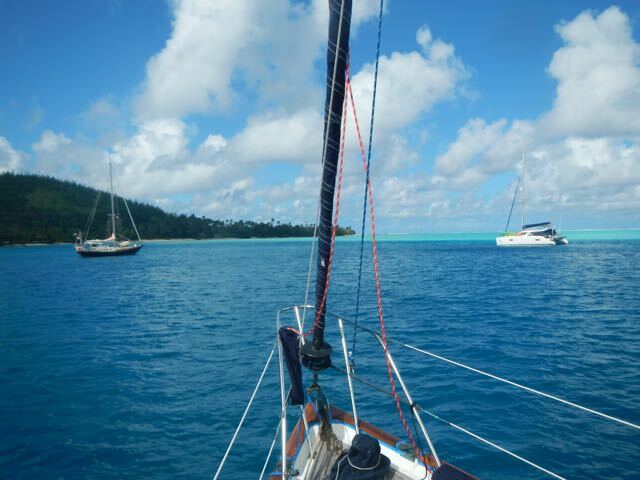 We arrived in early afternoon and I snapped this photo from our foredeck. The dark-hulled boat at left is the home of our friends Chris and Margaret from Hobart, Australia. The boat's name is "Storm Bay" and we met them when we were all in San Carlos, Mexico, several years ago. That's cruising. This is the best photo I have of the astounding color change between the shallow and deep water between us and the Pacific. You can just see the breakers pounding on the outside reef. 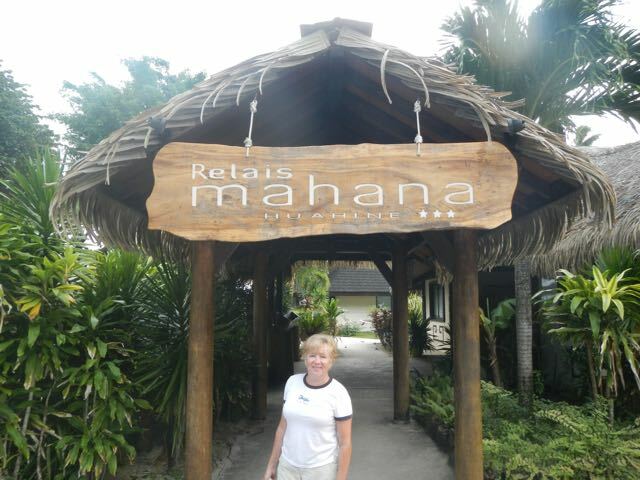 Conni in front of the Relais Mahana, or Mahana Resort, the big and very nice resort that makes its home here. They've been very good to boaters, and us, in particular. 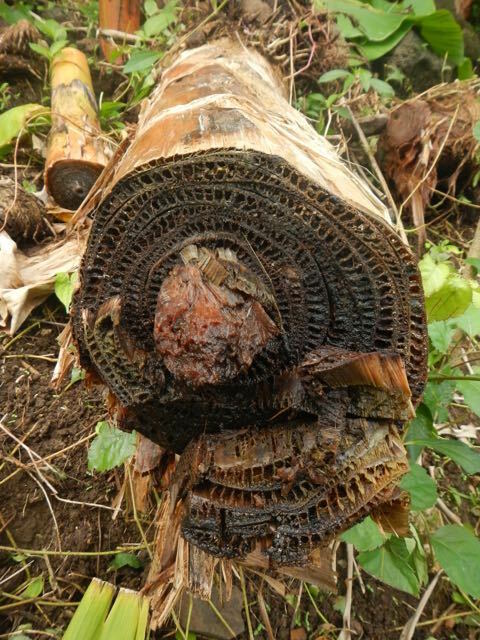 A dead banana trees with a bit of rot set in allows us to see the inner workings of the tree's "plumbing". Looks like a lot of water moves through it. Lovely Conni shows what she can do to a flower. 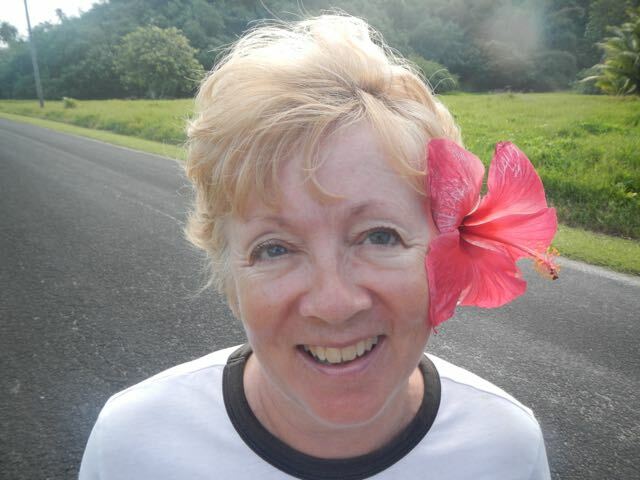 I picked the hibiscus (thanks, Toni) for her and she wore it all day. House for lease, and it's a lot of land and house. For those in Alaska, it's a long distance call. 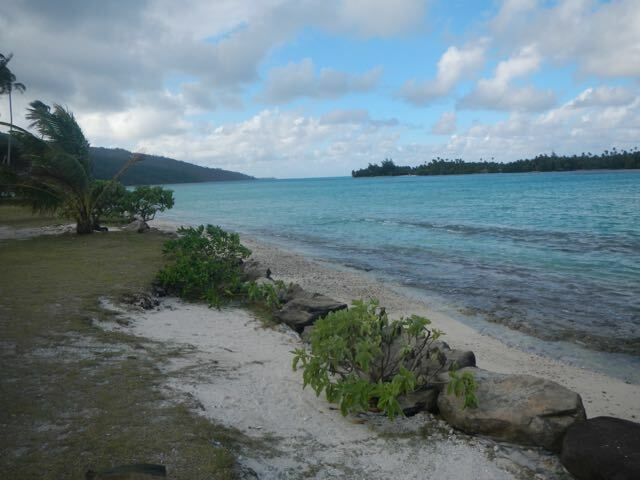 We walked a couple of miles down the coast road, all the way to the Anini Marae and came out at this beautiful location. 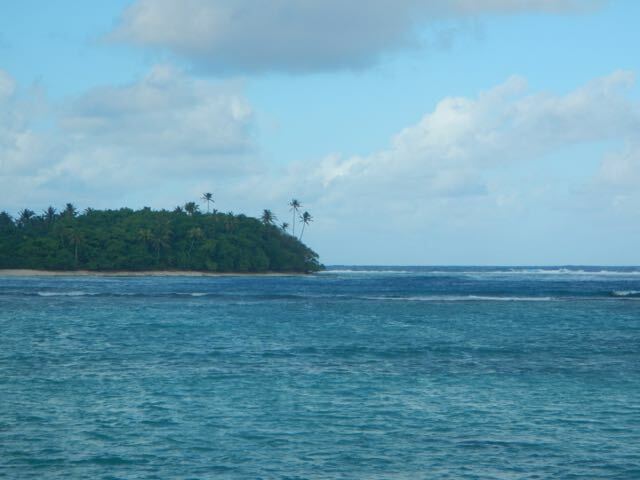 There is an offshore reef, then a lagoon reef, visible here. The motu is lovely. 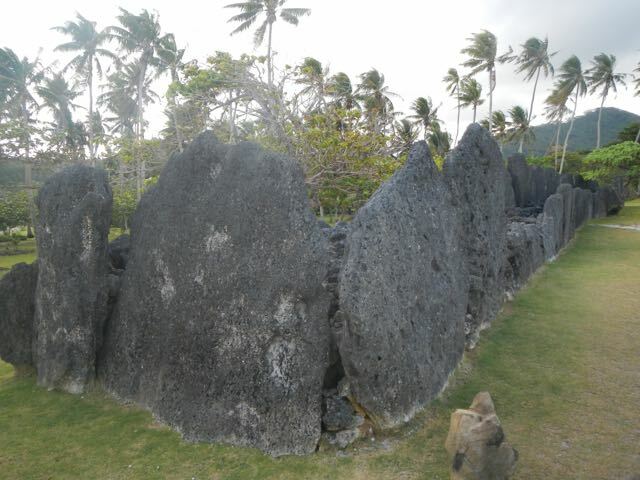 The Anini Marae or holy place is the typical rectangular set of stones with fill inside. Since there was no language and the missionaries forbade any practice of their religion, little is known about how the structure was built, used, or its meaning. 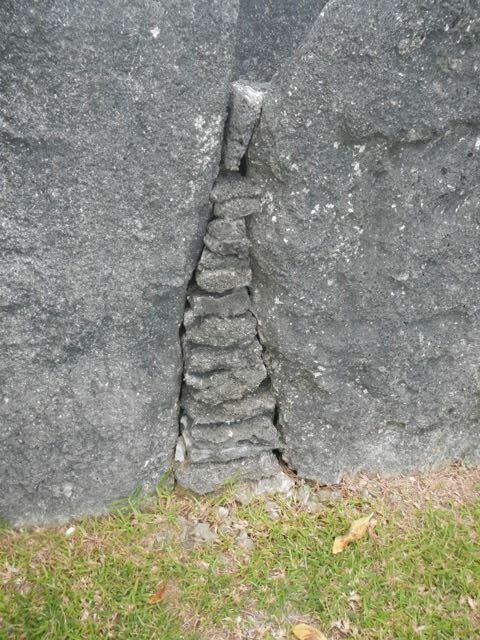 This inner structure for a Marae was not a common fixture. As usual, the mareae's are situated in gorgeous locations and always right on the water. 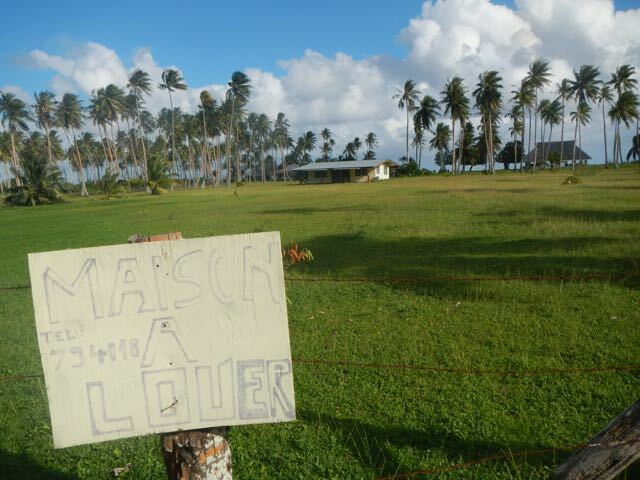 Marae Anini was no exception. 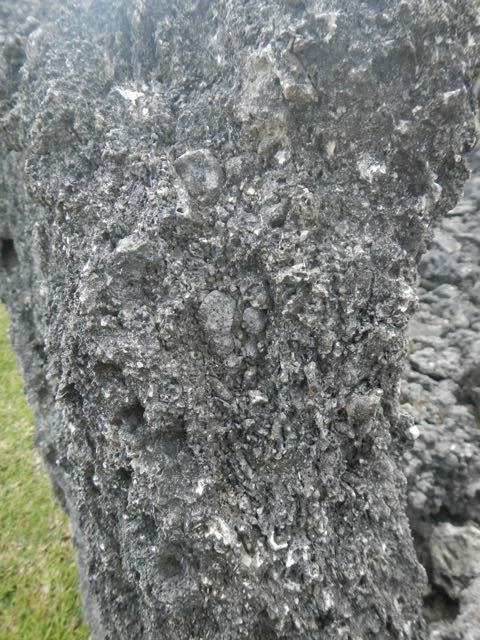 This is coquina, the material from which the marae's are constructed. 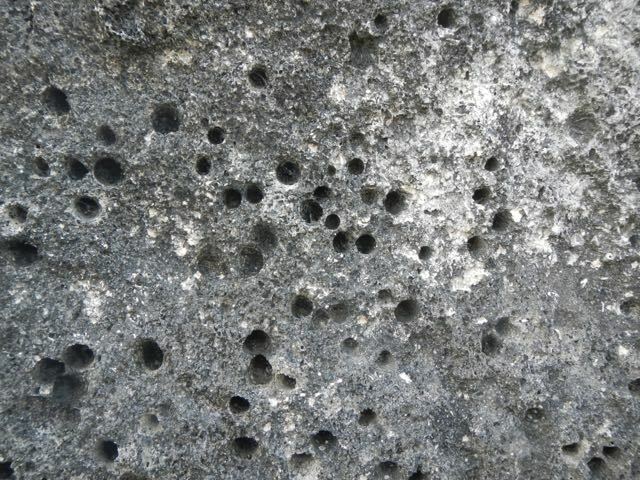 It's exactly what it appears to be: sedimentary rock made of sand, coral, and shells. One of my favorite things to see: the unmistakable signs of another human's ingenuity. 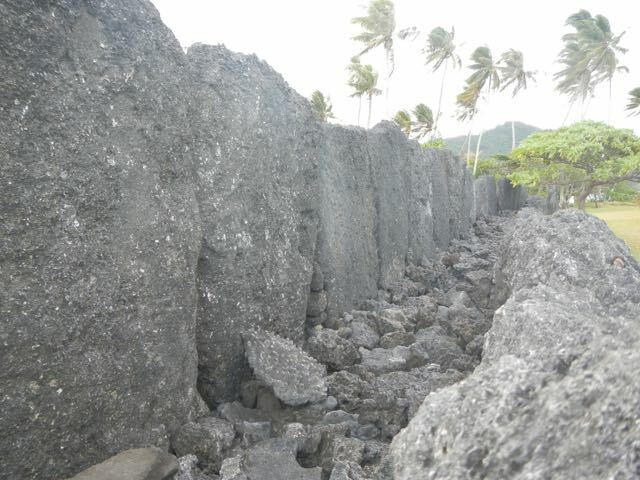 The person, male probably, saw that the gap needed to be filled, and he selected and stacked the best stones that he had at his disposal to accomplish his task. 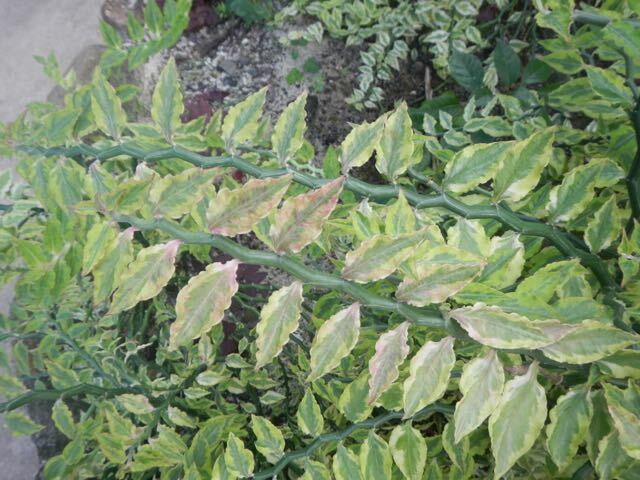 It's artfully and successfully done. Oh, yeah, it's lasted for 1000 years, too. 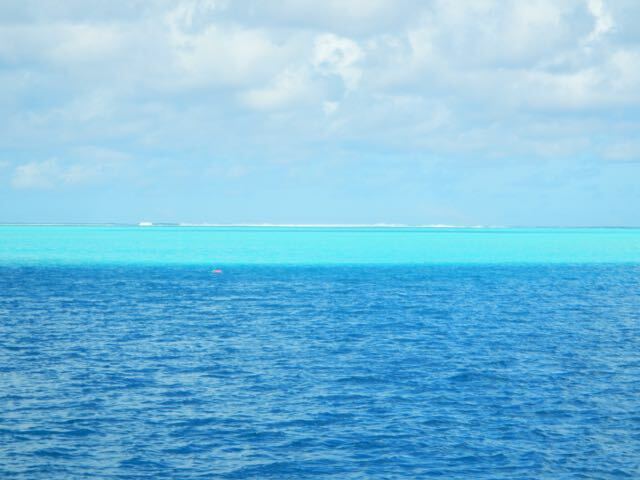 No reason for this photo than our seeing that lovely sailboat on the reef. One wonders what prevents someone from simply dragging her back to sea. Here's the reason. Imagine a fiberglass hull being rubbed on this stuff, hour after hour, day after day. It simply grinds through anything. Even if the boat has no hole initially, she will after a few days of this. Local construction. The verticals are all trees, of course. 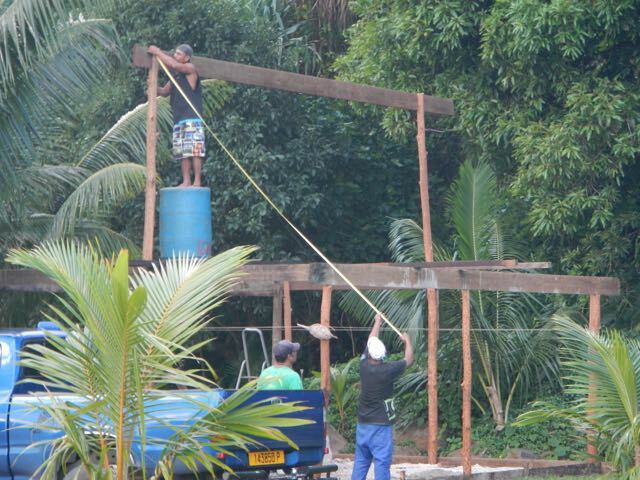 I don't think that the "ladder" is OSHA approved, but it works. They're people who make do. Returning to the boat, I took this shot of Wings in the mooring field. I have no idea what this is, but Conni and I were amazed at the wavy structure of the stem. 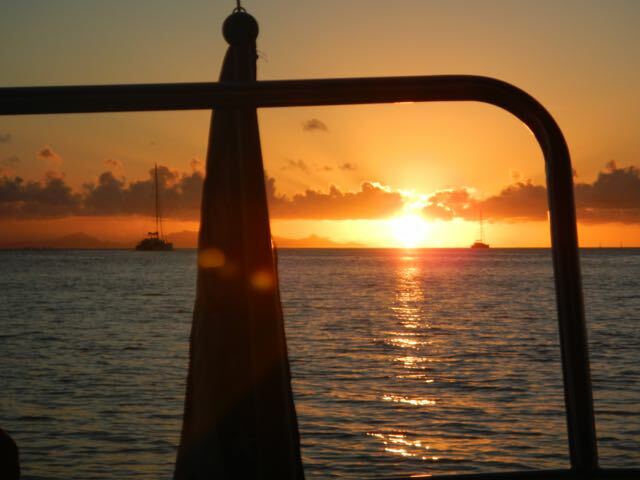 Sunset from Wings' stern, with Raiatea and Taha'a in the background. 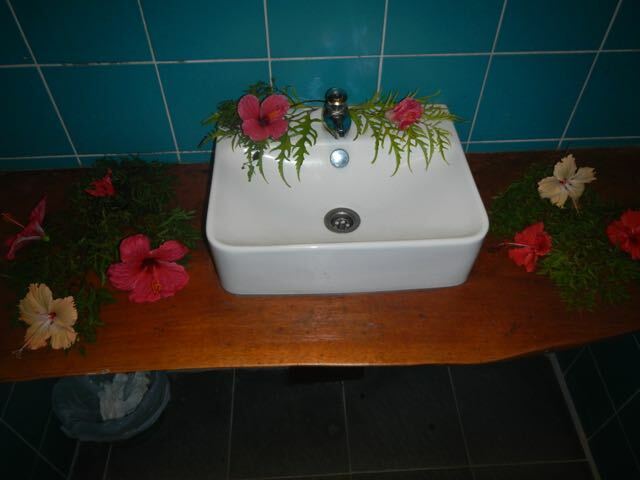 Relais Mahana's men's rest room had a sink decorated beautifully. It was not what I expected in a men's room, but I appreciate someone's thinking that we have some esthetic sense. We try to support any business that supports boaters, so after our walk, we strolled into the Relais Mahana's bar, each consuming a large Hinano on tap. We stayed so long that we were able to transition to Happy Hour! 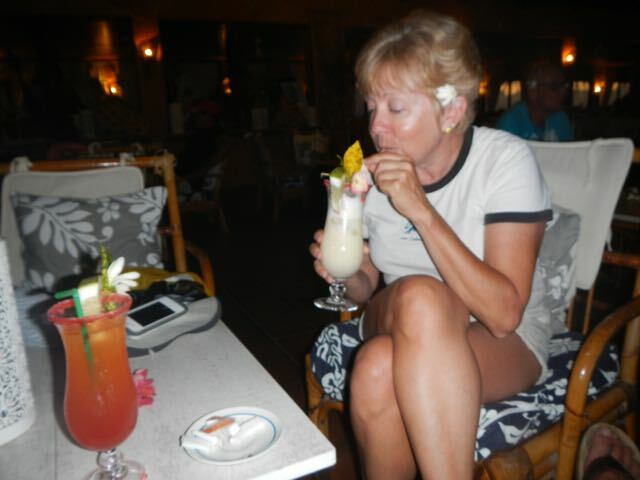 As usual, I ordered a MaiTai and Conni had a Chichi. 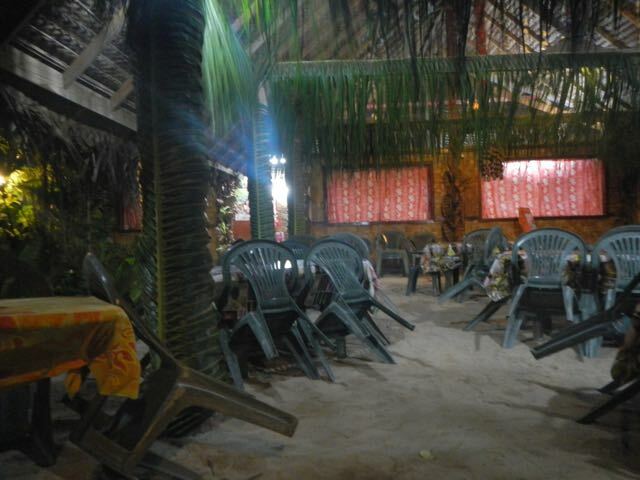 Our favorite, poisson cru, or raw fish in coconut milk, and lots of tasty, tangy vegetables. 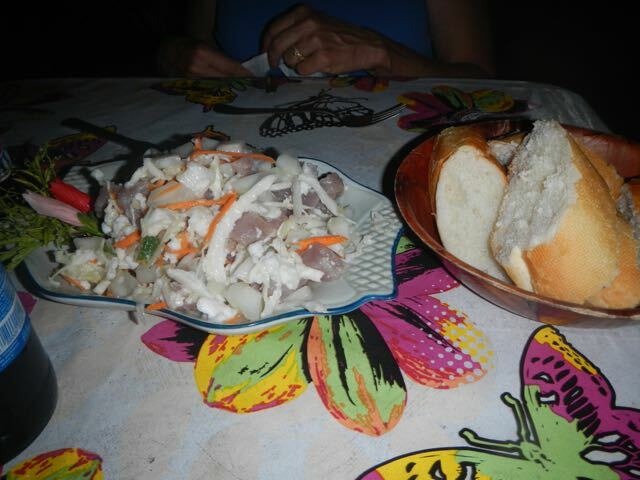 Conni's eaten her way around the Pacific sampling this dish, the national dish of French Polynesia. 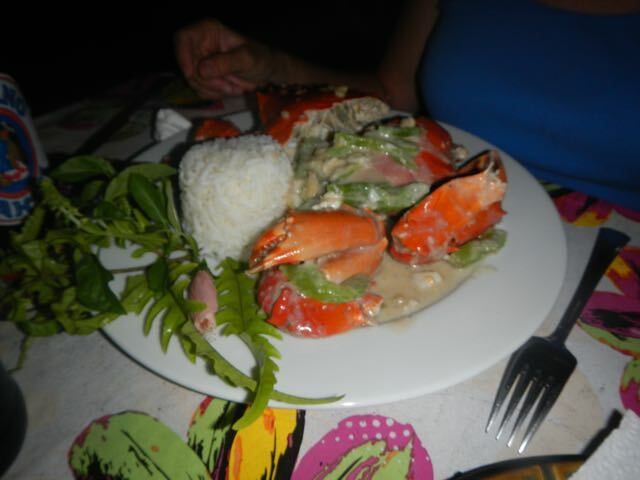 There are two restaurants in the Society Islands that offer Tahitian crab and Conni knew that this was one of them. To our surprise and delight, they were serving it that evening. It's a much larger crab that we had anticipated. 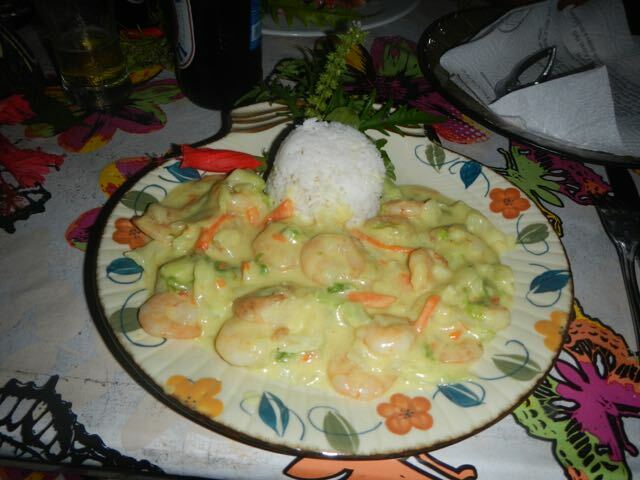 This delectable meal on the shell plate is my shrimp curry with coconut milk. Holy smokes was it rich! We had this famous restaurant to ourselves, for heaven's sake. The guide book said that reservations were essential. Not so much. It's a beautiful place, all open air without any glass in the windows. 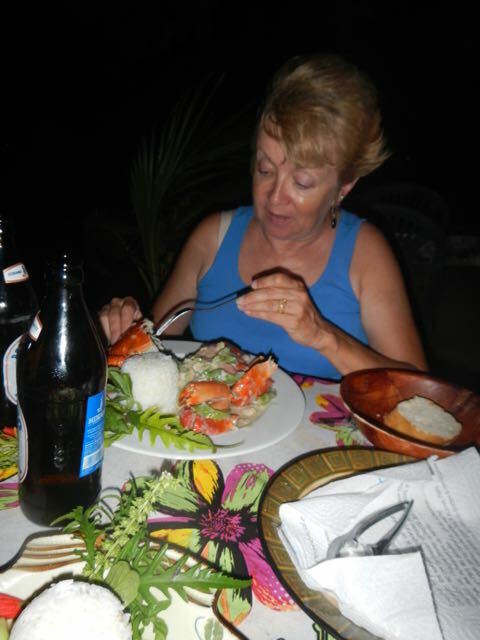 Conni is enjoying her Tahitian crab!